Traka USA, a leading developer of intelligent key and asset management solutions around the world, and Lenel Systems International Inc., a market leader in integrated access and video software solutions, announced an agreement to offer Traka USA Key Management Solutions to Lenel's North America and Latin America customers through Lenel's Value Added Resellers (VAR). From beginning on Friday to mid afternoon on Saturday we were inundated with people enquiring about our products and ourselves. We had Andy Fagan from wales helping me on the MiraClone and Iain Hume from Scotland who took over the Miracle A9 and continuously cut keys and showed all the benefits of this amazing machine. ASSA ABLOY and HID Global, both leading global brands, are joining forces at IFSEC 2013 to showcase a broad range of electronic access control products and solutions. These include standalone, integrated, wired, wireless and IP access control solutions to address customer security requirements across multiple vertical sectors and applications. Ingersoll Rand recently launched its new aptiQ multi-technology reader at IFSEC 2013, as well as demonstrating the new CISA eSIGNO contactless lock, the PegaSys intelligent access control system, and Interflex customised solutions. Their electronic access control products including biometric handreaders will also be linked up to Ingersoll Rand’s software solutions for a live, interactive experience. 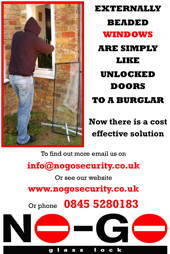 Paxton are introducing the Net2 Entry Vandal Resistant Panel at IFSEC 2013. A smart, simple and super tough door entry solution, the panel is made from marine grade stainless steel with an attractive finish that will withstand the elements. "I'm mad as hell," Jerry Goodwin exclaimed, standing on his back deck in Acworth, "They said it'd cost about 100 bucks." He was talking about a bill he got from a locksmith who replaced his lock, reports US TV Channel 11Alive. "It was 424 dollars! They said, 'Oh yeah it'd cost a 100 bucks', a 30 dollar call out and 70 dollars, to replace the lock." Jerry Goodwin is not alone. The Governor's Office of Consumer Protection has been getting complaints about locksmiths, accused of gouging customers. The European Commission published a proposal for a directive for network and information security on 7 February 2013. This was accompanied by a cyber security strategy that contains non-legislative measures on a broad range of issues. These documents can be found on the European Commission website. A breach of security at two payment card-processing companies in India that led to heists at cash machines around the world has reopened questions on the risks of outsourcing sensitive financial services to the country. Global banks that ship work to be processed in India, either in-house or to large IT services vendors, were already under pressure to step up oversight of back-office functions after a series of scandals last year. Wiegand Wire is a secure technology that remains relevant for today's market, according to ID specialist Databac Group. The card manufacturer announces that it will continue to produce cards incorporating Wiegand technology for as long as there is market demand. Despite HID discontinuing its Wiegand card and reader range as of last month, Databac will support those wishing to retain their investment in the technology. Operators of industrial units can prevent employees being threatened or injured or disturbed out of hours when attending security alerts, if they look at a Keyhold from Sector Security that will safeguard both employee safety and wellbeing. While here in the UK the police occasionally issue free bike locks, it's a rather different story in the USA, where as we know, it is a constitutional right to bear arms. Now, the Willits, California, Police Department and the Book Juggler owners have partnered with the National Shooting Sports Foundation to distribute free gun locks to the Willits community. Westminster City Council will be rolling out a new waste bin container-locking device across the borough this summer following successful security trials earlier this year. It is designed to deter metal theft in the borough and will support the council in its waste reduction efforts. Chief executive Nick Buckles, who was instrumental in creating the G4S business through the merger of Securicor and the security businesses of Group 4 Falck in 2004, stands down.He is to retire from the company and will be replaced on June 1 by Ashley Almanza, who has held senior roles at oil and gas group BG Group. G4S's Olympics failure saw Mr Buckles appear before MPs, during which he admitted it was a "humiliating shambles for the company." Extra military personnel had to be called in to fill the gap left by G4S's failure to supply enough staff for the £284m contract for the Games, held in London last year. Yale is turning up the heat on potential sales for locksmiths this summer through its first 'Safecation' campaign. 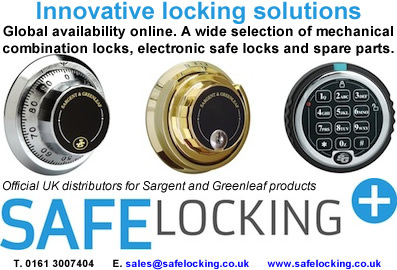 Building on the success of Yale's 'We Love Locks' initiative - launched in February - the company is assisting locksmiths in giving Britain a safe summer through increased security awareness and use of its products. Free bike security locks were on offer at Bedford Railway Station recently in an attempt to cut the number of cycle thefts, reports Bedford Today. First Capital Connect (FCC) and the British Transport Police (BTP) stepped up their campaign against cycle crime at Bedford railway station by handing out free high security locks worth around £40. The funeral of a well known Seaford locksmith, who had been working in the town for more than 30 years, was held at St Leonard’s Church in Seaford on Friday May 24. Andy Anderson, who opened County Hardware in the town, passed away peacefully on Friday May 10, aged 80, with his wife of 51 years, Barbara, by his side. The Standards Development team at Skills for Security has been working with representatives from the Security Search Operations sector to review the National Occupational Standards (NOS). 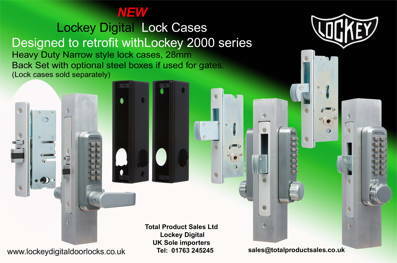 Designed specifically to retrofit with The Lockey Digital 2000 series the new heavy duty narrow style Lock Cases are the ideal alternative to cylinder narrow style locks. Operated by Lockey mechanical digital locks on new or pre-prepped doors the LD900 series (pictured left) lock cases also offer added security with reliability. There are 3 options available, an Adams Rite style latch (LD930 pictured below right) which can be used with all the Lockey 2000 series latch models with knob or lever (2430,2435,2430DS,2835 & 2835DS). As market leaders providing electronic solutions for the Automotive industry, Hickleys have developed their product range to include electronic solutions and devices for government agencies and commercial security operations. Products include Mobile Phone Detectors, Signal Jammers, Secure Phones, Anti Surveilance Devices.